As graduation season comes to an end and summer kicks off, another generation of future leaders makes their transition from students to young professionals. While diplomas are earned for the work done in the classroom, for many the experiences outside of the typical classroom setting prove to be the most memorable. This is especially the case for Engineers Without Borders USA (EWB-USA) members across the country who take their learning to the next level. Natalie Rodrigues, Taylor Brown and Lisa Ponce are recent 2017 graduates and dedicated EWB-USA members who did just that. When they weren’t in the classroom, they were making the most of their EWB-USA affiliation by taking on leadership positions in their chapters and fostering connections with communities across the globe. Below, they share how being a part of EWB-USA enhanced their college experience and equipped them to thrive in the professional world. Being a part of an EWB-USA chapter offers an array of opportunities not usually available to college students: travel to project sites around the world, career-building field experience, and the chance to collaborate with partner communities across the globe to meet their basic human needs. “I had the opportunity to work on a sanitation project in Guatemala that our chapter was working on with the EWB-USA Syracuse Professional Chapter. I got to learn from professionals, my peers and the community members that we were working with,” said Natalie. EWB-USA student members can use their voices to have a profound impact on their chapter, their region and the national organization as a whole. 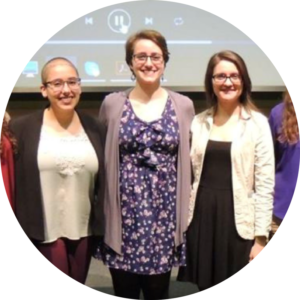 All three women said that holding leadership roles in their chapters increased the value of their experience within EWB-USA, while building skills necessary to thrive in the workplace. “Being in a leadership position gives you skills that are highly valued in the workplace. These skills include communication, time management, working with a team, conflict resolution, problem solving and collaboration,” Taylor said. With final exams a distant memory, graduation parties behind them and diplomas in hand, all three women turn their focus towards their future careers. “My involvement with EWB-USA has made me want to pursue a career that can make a difference in the world through engineering,” Lisa shares. She plans to start work at an engineering firm and will remain involved with EWB-USA as a professional member. The future path may have its uncertainties, but with EWB-USA experience in their arsenal, Taylor, Natalie and Lisa are equipped to make the most of their new journeys as young professionals. Inspired by Lisa, Natalie and Taylor’s stories? Here are some easy ways to become part of EWB-USA’s community of world-changers! Use our chapter map to connect with a chapter near you. Become an EWB-USA member. Membership opens the door to volunteer opportunities here at home and around the globe, connections to the world’s premier engineering firms, and networking with likeminded peers in our online community, Volunteer Village. Remember: you don’t have to be an engineer to get involved! Explore leadership opportunities in your chapter or region. Being an officer offers valuable experience that lasts well beyond your college years (and it looks great on resumes, too! ).